Sewer Line Repair | Brooks Plumbing Co.
You cannot see your sewer line, and you probably don’t want to think about it much… but it handles an important task for your home’s comfort and sanitation. All the waste water lines in your home’s plumbing connect to the sewer line, which then transports the sewage to the sewer main that beneath the center of the street. 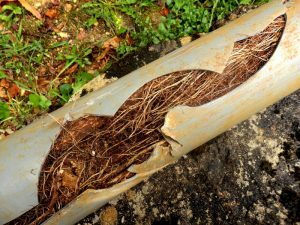 The city is responsible for the main sewer line, but you, the homeowner, have the responsibility for repairing your sewer line should it sustain damage. If the sewage line starts to back up because of damage, one of the first places you will notice it is in the drains of your sinks. If you hear strange gurgling sounds emanating from the drains after you run water down them, it means air trapped in the sewage below is getting released into the water above. As the blockage rises higher into the pipes, you will start to notice slow drains throughout your home. A slow drain in one place usually means a simple clog, but if the problem appears in all your drains, it’s a strong signal that a broken sewer line is at fault. One place in your house that is particularly in danger from a backed-up sewer line is your basement. If you spot rings of water around the drains in your basement, or smell noxious sewer odors from down there, then you need to call for professional inspection on the sewer line immediately. This is connected to the problem with the slow drains: if it happens with only one toilet, it usually means an isolated problem. But if the toilet levels around the house start to become irregular, then there is a deeper problem with the plumbing. Leaking sewage from a broken line will begin to surface in the yard above the break. Call for a plumber if your lawn starts to develop an unpleasant, septic odor. Sewer lines are buried too far for you to attempt to repair them on your own (and you don’t want to accidentally cause damage to the municipal sewer line). Bring in a professional plumber in Olympia, WA when you see the signs that you have problems with your vital sewer line. Brooks Plumbing has served Olympia since 1994, and we can handle any plumbing trouble you have.